As I told in my latest post I am currently visiting Edinburgh. Although you could believe that the reason for my visit could be my crush for this lovely city with an enormous number of thrift shops and a great Anthropologie store, it is not the reasons. The reason is neither that Edinburgh is the city where J K Rowling got a lot of inspiration for the Harry Potter books. I have to say that it would have been a very good reason to visit Edinburgh as I sometimes almost expect to see Professor Snape sneak out from an alley, or see Harry, Ron, and Hermione cross some of the lawns (although they still are pretty wet). For my inner eyes I also see Mr Keating kicking a ball with fifteen boys in school uniforms (You know the scene from Dead Poets Society on of my favorite movies all time). But, the reason that I am visiting Edinburgh is that it is a part of the post doctoral grant that I have (I wrote about it a little here), which aims at promote more collaborations among European ageing researchers. As a part of this, I am currently a guest researcher at the Center for Cognitive Ageing and Cognitive Epidemiology at the University of Edinburgh. While I have been here I have mainly focused on a research topic that I think might interest many of you – old persons’ ability to accept their bodily appearance. I don’t want to reveal too much about the results, yet, but I am very excited! It is fun to do research on something that is a little bite different from what I usually do research on (obesity, change in weight (or body mass index), and how it relates to ageing, and brain ageing in particular), but bodily acceptance is still not totally disconnected. I will tell you more when it is convenient. As you probably have understood, I am very happy with my visit in Edinburgh so far. The only thing I am not satisfied is the internet connection I have where I live. I have not been able to read or comment on the blogs that I like to read. Or when I have been able to read and comment, then the internet has crashed and my comments have gone lost in Cyberspace. However, I will have some better internet connection this weekend so hopefully I will be able catch up a little! Ohhh yes, I am showing you the backside of the purse too in the picture below, not on pur(po)se though! 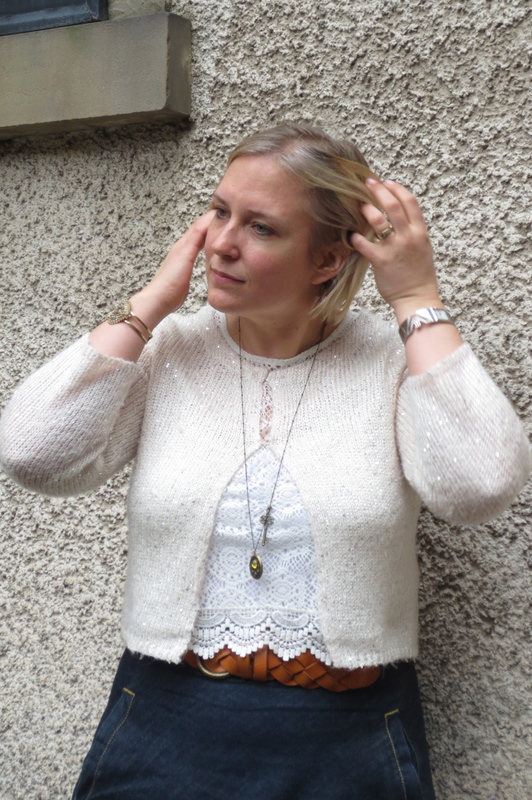 This entry was posted in What to wear in the transition between winter and spring and tagged belt, denim, denim skirt, knitted cardigan, lace, noa noa, style. Bookmark the permalink. I love the cream top and skirt. I went to Edinburgh in 1984 and it is a lovely city. Your research sounds very interesting. I am off to Cambridge next week for a conference so look forward to posting some sightseeing pics too. I have never been to Cambridge so I will look forward to your sightseeing pictures, and to see what you wore at the conference! Thank you Jane for stopping by at my blog regularly and leave comments, it means a lot to me! You look gorgeous and happy! I understand so well that you like Edinburgh. I was in Scotland in 2003 and Edinburgh was our first stay for 3 days. I remember the high street with it’s picturesque buildings and the castle but I also liked the newer parts of the city. It must be great to meet scientiest from all over Europe and to exchange experiences and thoughts. Your blue and white outfit is amazing, I love particularly the belt and the handbag. Hi Sabine! Yes, it is a great postdoctoral arrangement that I have. Every summer they arrange a summer school for us too, where all the recipients of the grant get to meet up, exchange ideas, and listen to great talks! I just had to try to come up with something that was more sping like than the things I have worn lately. I hope you enjoy your weekend! Thank you Brett, the lace top is a favorite! Actually, lace in general is a favorite! I hope you enjoy your weekend too!